So, it’s no secret that I’m not a parenting expert. I don’t have a degree in child psychology or childhood education. But, I am the mom of 4 kids, so I’m pretty good at fixing boo boos and I make a mean peanut butter and jelly sandwich. 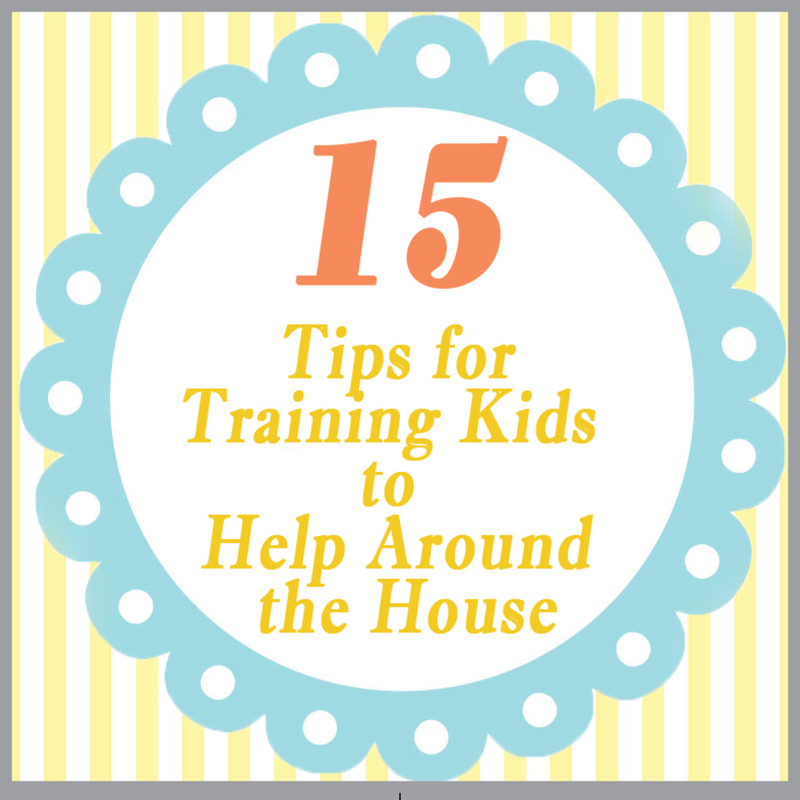 And I do have a few pointers I’ve learned about what works with getting kids to help out around the house. And even if you find just one of these tips to help with your kids, I’m happy. My philosophy on whether kids should be responsible for helping out around the house is simply: yes. Since there are 6 people who live in our house, all 6 of us have different responsibilities. And if you don’t already have a plan like this in your home, maybe some of these tips can help. 1. Start by figuring out what chores and responsibilities are age-appropriate for your kids. Click here for a helpful list of chores categorized by age. Keep in mind that these are suggestions and can be flexible. 2. Start early. Considering tip #1, start letting kids be involved with household chores as early as they can understand, especially when it comes to cleaning up after themselves. I have taught my kids to clean up their own toys since they were old enough to play with them. Remember, if they’re old enough to take them out of the toy basket, they are old enough to learn that’s where they should be returned. 3. Note your child’s strengths and weaknesses, and plan accordingly. I have one particular child who loves to organize, and she’s very good at it. So, I usually assign those types of chores to her so she gets to do something she loves, and I know it will be done right. However, don’t be tempted to load the bulk of the work on one child just because they do a better job. You don’t want to take advantage of the good worker nor deprive the others of learning to do better. 4. Be organized. It always helps kids to have things labeled in places where they will be putting things away. If the kids are too young to read, you can even use pictures. There’s something satisfying about getting things arranged and in order, and when children start to feel this, they’ll be more motivated to take initiative to put things away without being asked. Click here for a little tutorial for cheap and easy chalkboard labels we use in our closets and playroom. 6. Never underestimate the power of a list. Don’t you love the feeling of checking off your tasks one-by-one until a list is complete? Kids do, too! I’m always amazed at how fast the chores get done when I give each of my kids a list. Have older kids? You can even text them their list. And for the younger ones who may not be able to read, draw a little picture for them. (I’m not much of an artist, so I have to explain what the pictures are first!) But, the kids love it, and have even been known to ask me for a list once in a great while. Download these onto your playlist and challenge the kids to get all the clutter cleaned up before the music ends. I do my best choreography to a couple of these. Maybe I’ll post a video sometime. Or maybe not. 8. Make a “Jar of Chores”.This is simply a jar or container which contains different jobs written on slips of paper that the kids can close their eyes and pick. Some may be harder, some easier, but they will like the thrill of not knowing what to expect. And if they choose a job and want to trade with someone else, let them do it if the other person agrees. 9. Dirtiest cloth game. So, no, my teenagers don’t really fall for this one anymore, but it was a great one years ago, and it’s still fun for my younger two. I do this when the baseboards need cleaning or when I might be behind on dusting (which, of course, rarely happens! ha!). The plan is to give each child a nice clean cloth and a set amount of time to go around and dirty it up. It’s a race to see who can wipe around the baseboards faster and bring back the dirtiest cloth. Give a little prize to the winner and something small for the runners-up as well. 10. Safe cleaners. When we moved into this house, my kids got their own bathrooms, along with the responsibility of keeping them clean. My younger two share a bathroom, so my 9-year-old cleans theirs. She’s been doing that for about a year now, and would’ve started sooner if I would have let her! The only reservation I had when we started was that I didn’t want them to overuse chemicals and poison themselves. So, I mix up my own bathroom cleaner using this methodand it does a great job! For windows and glass, I use only these glass cleaning cloths and water. They are the best! This way, there’s no concern with mixing cleansers or harmful fumes. 11. Talk to your children about why they need to work. Chances are, if you are just starting a work routine for your kids, they aren’t going to like it. In fact, even though my kids have done chores all their lives, they still complain at times. That’s when it’s important to talk about why. The truth is, it not only helps Mom and Dad, it does the kids a world of good. They need to know that with privilege comes responsibility. (“You get to live in a nice comfortable home, but you also need to do your part to take care of it.”) It’s also a principle of being in a family and working together. Everyone does their part to help the team. All this translates into becoming a responsible adult, a dependable employee, and a good citizen in the future. I also like to emphasize that, with responsibility, often comes privilege! For instance, getting old enough to take on an extra chore, like washing dishes, may also bring an extra privilege, such as staying up 30 minutes later at night or helping to choose a meal for the week. 12. Cuteness counts. Kids are much more excited about working if they have cute apron and fun tools. 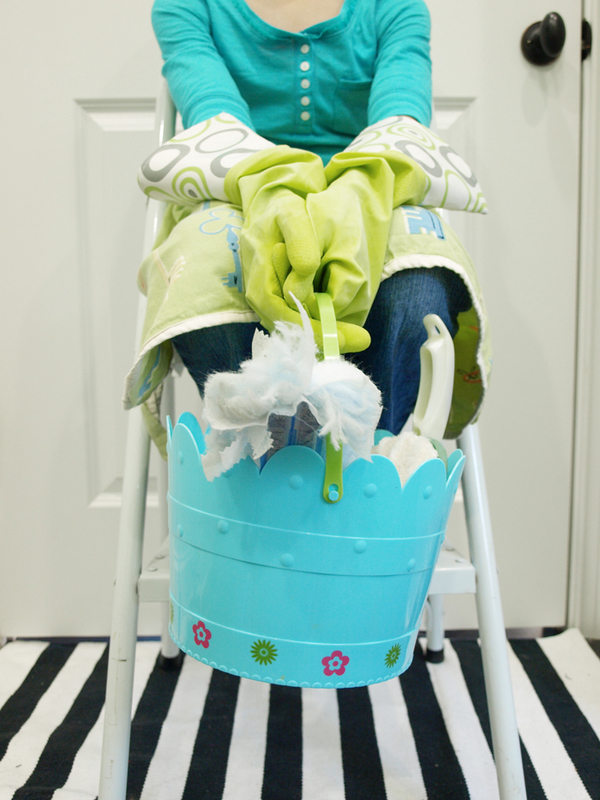 We have an old Easter bucket I bought years ago that’s perfect for holding kid-sized supplies. We fill the bucket with warm soapy water for when we wash down cabinets and the job is way more fun! 13. To pay or not to pay? Yes, that is the question. And I get asked it a lot. Should you pay your kids an allowance for doing chores around the house? The decision, of course, is up to you. But, my husband and I do not pay our kids for doing their basic chores and responsibilities. Instead, we emphasize to them that everyone has certain responsibilities, both personal and public, and sometimes the payment is the feeling of satisfaction in a job well done. There are times, though, that we will assign a special job on top of their regular list and pay them a little for doing a good job at it. It may be cleaning the playroom after company has been here or blowing the leaves in the Fall. And, on occasion, I’ve been known to offer up a few dollars to the first person to volunteer for a “surprise” job, which could be anything from weeding the front beds to organizing a cabinet. 14. Give the Clean Room Award. This is another way to use positive reinforcement when training your kids to help out around the house. I’ve used this award much like the “You Before Me” Award I explained about in this post. My kids know it’s their responsibility to make their beds every day and keep the clutter picked up, but I’ve been known to do a surprise check now and then and award an extra-clean room with this special award. A few dollars clipped on is great motivation to win next time, too! 15. This may be the most important. Never use work as punishment. If a child misbehaves, resist the temptation to seize the opportunity to get your floors mopped or the car cleaned out, and give a more appropriate punishment instead. As I’ve already stated, work is simply a part of life. It’s good for us. The opinion of work that you instill in them in their early years will likely stick with them throughout their lives. If you want your kids to learn this early in life and grow up to be a responsible adult, avoid sending the message that work is always bad. Explain to your kids that it’s simply not right to always rely on others around you to take care of things and never do your part. Do, however, require that a job is done correctly. For instance, if you have explained the way you’d like the dishes washed, yet the dishes come out dirty because someone rushed or wasn’t thorough, the job will need to be done again until it’s right. And finally, when your kids do a good job, make a big deal about it! Be sure to tell them how proud you are and brag about it to others in front of them. They will remember your reaction long after the task is done. So, apparently I can go on and on about this subject, but I’ll stop now, lest this post go on forever. I’d like to think that I’m more Mary Poppins than Cinderella’s wicked stepmother, but I guess that’s up to my kids. Spoonfuls of sugar for everyone! Linking with some of these parties. Check them out! This entry was posted in Uncategorized and tagged Cleaning, Family, Kids, Organization. Bookmark the permalink. Follow any comments here with the RSS feed for this post. Post a comment or leave a trackback: Trackback URL. Agree with ya 100%, and it's currently what we do at our house. Going to try the cute baskets too. Those are some great ideas, Julie- You are a smart mom and I can tell that the kids probably do a good job on a regular basis. I so agree with not using "work" for punishment. These are great tips – my girls are little (4 and 1) but the older one definitely helps with chores and some of these tips will help us and they get older. Thanks! I have three kids and they've started helping around the house lately. It's been so nice and they get better with practice. I try to correct them on only one thing at a time so they don't get defeated. I'm feeling less like a maid in my own house these days! I've just never let on to my 6 yr old son that household duties are "chores." He still thinks of them as "opportunities" to participate. We call ourselves the "Getting Stuff Done Team" and work together and keep the mood light. He loves to help cook and I work hard to ensure that minor goofs or messes don't become a stressful thing. And I'm emphatic that there's no such thing as jobs for men versus jobs for women. My son helps me do laundry, vacuuming, cooking and cleaning as much as he helps me with "guy stuff" like taking out trash or raking leaves. The main area we have some trouble with is putting away shoes and getting dirty clothes in the hamper, so I'm definitely gonna try your checklist idea!